While in game type /simc to open the simulationcraft window. Now its time for raidbots. 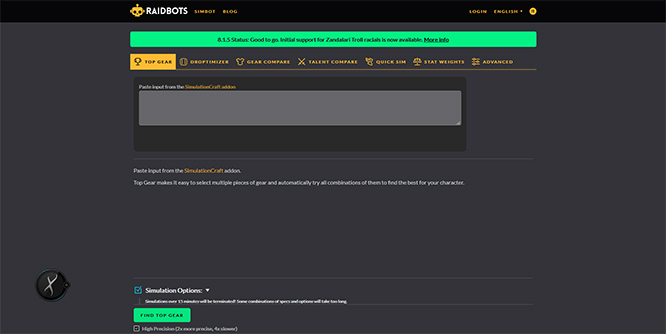 Go to http://www.raidbots.com in your web broswer. 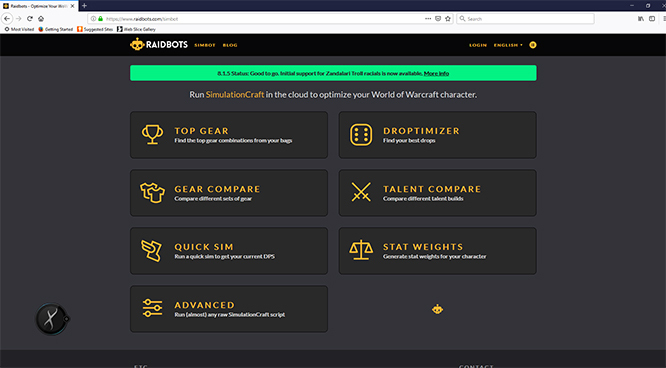 Here you have many different options you can choose from, but for this tutorial Im going to show how to sim gear and talents. Select “Top Gear”. 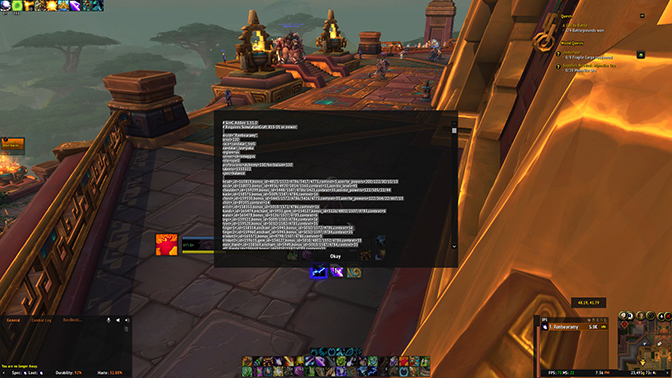 In the grey box paste the info you copied in warcraft by holing CTRL+V. Once the info is pasted you can see the list of gear that you have either equipped or in your bags. For this tutorial Im going to sim different trinkets. (Note: Free raidbots you have a set amount you can sim. If you decide to give to their patreon it unlocks to unlimited number of selections). Once you’ve selected your gear, scroll down the page. Here I picked my raid talents (as shown in picture below) to sim with the trinkets. There are many options to choose from but when simming gear its always better to use Patchwerk style single target fight. You can also select raid buffs (ie, potions, flasks, food, DH/Monk buffs, etc etc). Once you’re satisfied with your selections hit the green button “Find Top Gear”. Here its showing me I need to change a ring enchant from mastery to haste, and a weapon enchant from Quick Navigation to Torrent of Elements. 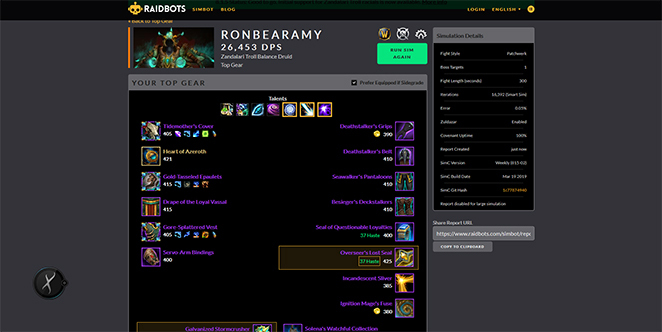 You can scroll down the page and see the comparison of the other combinations of gear you had simmed to see a difference in percentage of DPS. There you have it! You simmed your gear. Hopefully selected the right talents for your gear! Now you’re ready to raid! Feel free to play around with raidbots. The website is more up to date than ask mr robot, or other sim sites. See yall in game! Reci Resources Logs and Analyzer intro! SimCraft and RaidBots intro!